Danger – Do you smell smoke in the house when you use your fireplace or stove? If you do, and you have more than one flue in the same chimney, please read this carefully! 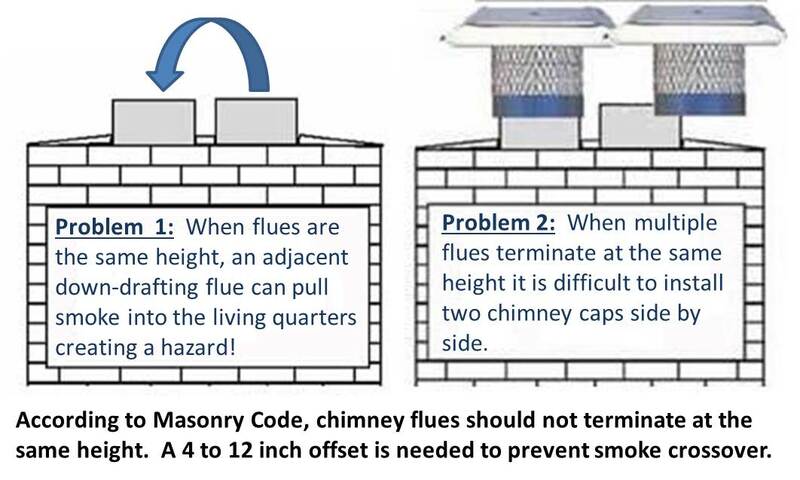 The Masonry Institute of America, which is the #1 source for published information on Masonry, states that adjacent flues should have a 4″ to 12″ in difference in vertical height, as shown above. The reason is to avoid smoke from exiting one flue and then being drawn down into the living area by an unused flue which is downdrafting. This is a common occurrence and may result in multiple problems…….from smoky smells in the house to actual poisoning of the residents! Yet most chimneys do not meet this standard. To make matters worse, the installation of a chimney cap – whether two single caps or one multi-flue cap – can make the situation much worse. Quotes from those who know! “I have a problem with reverse flow on my chimney when I crank down my wood stove. The smoke comes down the other flue for the fireplace even though I have a damper cap on top” – Todd W, Chippewa, WI. The Boost-a-Cap Solution! 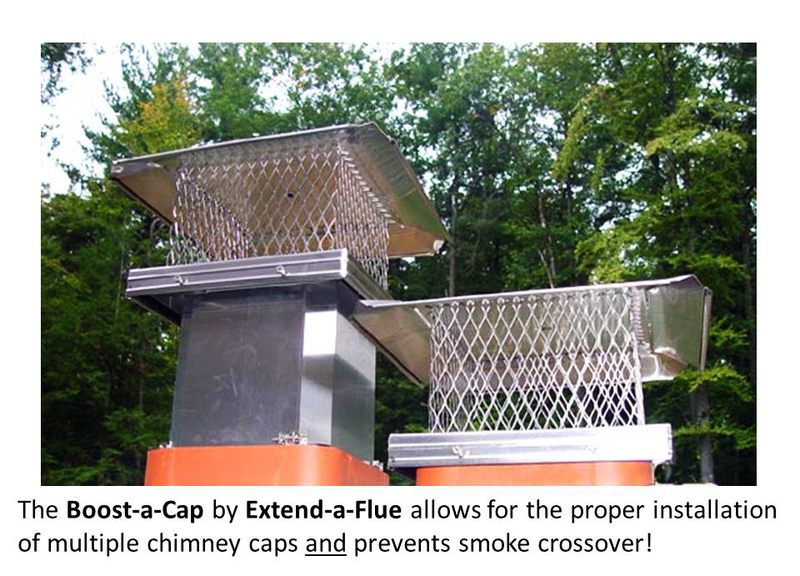 The patented stainless steel Boost-a-Cap increases the vertical height by 12 inches, preventing smoke crossover and allowing for the proper installation of two or more chimney caps! The Boost-A-Cap is available in 3 sizes: 8 x 8, 8 x 12 and 12 x 12. The chimney caps are not included, but can be purchased from us at discounted prices. If you already have a chimney cap, it should fit. Note: Our testing has shown that the 4″ minimum is not enough and that a separation of at least 7″ is required to properly address smoke crossover. 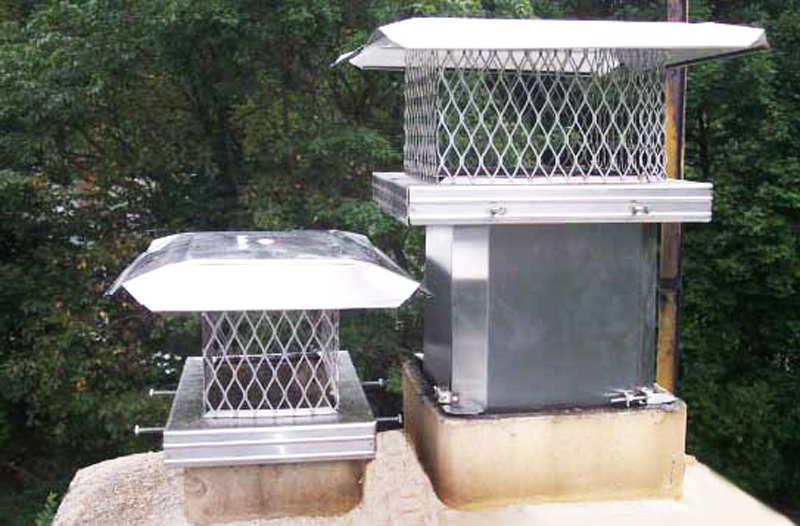 The Boost-a-Cap was designed to provide a 12 inch height difference so as to prevent smoke crossover and to allow for the proper installation of multiple chimney caps.